Colleagues and I happened to be at VivoCity for our 'unit' lunch and saw MV Doulos there. It's so sad that this would be her last port of call. It will be decommissioned very soon as it is costing too much to make it sea-worthy. 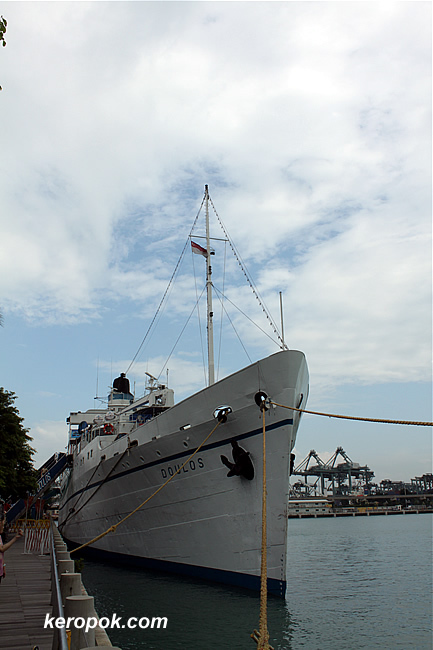 Doulos is the world's oldest ocean-going passenger ship. It's now 95 years old. I remember visiting it when I was a little kid with my parents. If you are looking for books to buy for children or Christian books, it's having a great great sale. Some last minute presents perhaps? What a wonderful old ship. Shame its sailing off into the sunset. i rmbr the doulos.. epic.. and such commendable good works too!